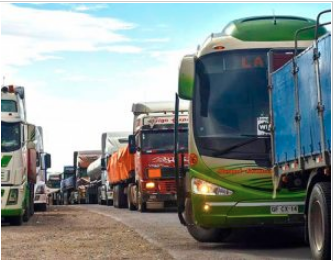 TRANSPORTATION EXPLAINS MAJOR LOSSES INCURRED BY BOLIVIA FOR ITS CENTENARY LANDLOCKED. A work done by economist Rodrigo Burgoa found that the maritime enclosure that Bolivia suffers since the invasion of its coast in February 1879 has a negative effect on the commercial flow that represents, on average, 11.7% of the Gross Domestic Product (GDP). The document is part of the studies of the Institute of Socio-Economic Research of the Bolivian Catholic University. “Obtaining his maritime status again would lead Bolivia to play in the world market without the disadvantages of which it is currently victimized. The need to have its own seaport not only has solid legal and historical arguments, but also economic ones,” he said. A couple of years ago, the Latin American Integration Association (2016) presented the results of a work developed on transport costs in the Latin American region. In this work, emphasizing the cost of transportation in international trade, it is concluded that Bolivian exporters must face an over-cost of 33.2%, compared to the regional average. A study conducted by the Bolivian Economy Center revealed that between 2013 and mid-2017 there were 62 days of strike in the Chilean port of Arica, which resulted in a loss of at least $300,000 dollars for Bolivian foreign trade. According to the document there are -at least- four reasons why landlocked countries have a lower economic performance: Dependence on transit infrastructure, of political relations with neighbors, peace and stability with transit countries and administrative processes in transit. The study recommends investment and specialization in industries that are not as sensitive to transportation costs [which is another constraint]. In terms of trade, it was possible to find 15% as the magnitude of the disadvantage that not only affects the Mediterranean countries, but also Bolivia, the only land-locked country in the world. Been landlocked characterizes almost 25% of all the countries in the world. Landlocked countries lose about 15% of their trade flow. There are 44 landlocked countries in the world, including a sui generis case, the Vatican State. Bolivia was born to its independent life with more than 400 kilometers of coastline on the Pacific Ocean and was forced by Chile to cede that territory after the Pacific War (1879-1883). Of the 44 countries, more than half are in the continents of Europe and Africa, 17 and 16, respectively. Also, 10 Mediterranean countries are located in Asia and only 2 in the Americas, one of them being Bolivia. For each percentage point in which the distance between countries increases, trade between them decreases 1.57%, a fairly high figure. Countries that lack their own maritime coastline reduce their trade by 15%. Therefore, the Mediterranean nations start with a disadvantage when competing for international markets. The commercial flow lost due to geographical enclosure represents between 10 and 13% of GDP in the years under study 2006-2017. This entry was posted in Bolivia, Business, Economics, Politics, Social Unrest and tagged 1879 Pacific war, competitiveness, government failures, invasion, land-locked economies. Bookmark the permalink.